What should I expect with Top Rated Plus items? What additional criteria must sellers meet for their items to be eligible for the seal? Sellers are consistently monitored by eBay for compliance. Do sellers pay to get this seal? How quickly must a seller ship an item? After payment has been received, sellers must ship the item with tracking information by 11:59pm the next business day. If the delivery method offered by the seller is freight, the method typically used to ship very heavy items like furniture or farm equipment, then the seller may take longer than one business day to ship and may not provide tracking information. What happens if the seller doesn't meet these standards? Sellers are consistently monitored by eBay for compliance. If tracking information or buyer feedback shows that a seller isn't meeting standards, the seller's listings will no longer feature the eBay Top Rated Plus seal, and the seller will not qualify for discounts or receive favored search result rankings. If you're unable to return items per the seller's stated return policy, you may still be covered by eBay Buyer Protection. How is this different than the old eBay Top Rated seller program? It's better. Buyers will be able to quickly identify listings from sellers with a great track record that offer at least a 14-day money-back return policy, as well as shipping in a business day with tracking provided. eBay Top Rated Plus items can be returned to the seller for a refund. The items should be returned in the same condition that they were received and restocking fees may apply to certain items. See the listing description for more details or contact the seller with any questions. For more information, eBay's suggested return guidelines can be found here. 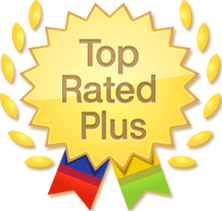 Are there types of listings that may not qualify for the Top Rated Plus seal? Listings offering Real Estate or Specialty Services will not qualify for the Top Rated Plus seal, since they are generally not expected to offer returns given the nature of the items sold. Similarly, listings that offer only Local Pickup will not qualify for the seal.